Cruise lines have offered Internet connections to passengers for quite some time, but in many/most cases, those connections were barely usable. Those of us who remember 14.4k modems might have the patience to muddle through if we really needed to get that email out, but those who grew up with DSL and cable modems aren’t likely to sit there waiting minutes for a web page to load. Actual speeds I measured on board were often in the 40 to 200 Kbps range. I should note that this has been a big disappointment to me in part because my very first cruise spoiled me for the later experiences. 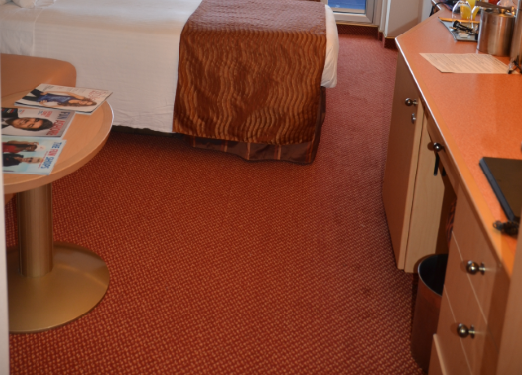 I happened to take that first cruise on the Carnival Magic in 2013, when they were testing new, unlimited connections. It was fairly reliable and reasonably fast, and it formed my first impression of Internet at sea. Then the testing ended, and every other cruise (including on the Magic) offered only super slow, ultra-expensive Internet service that regularly dropped the connection altogether. It was frustrating, and all the more so because I knew it could be different; I had experienced that difference. The cruise lines didn’t do this to deliberately infuriate their customers. There are very real technical limitations and obstacles to sending signals to a ship in the middle of the ocean. There were problems that had to be ironed out before they could roll out new tech to their ships. It required new hardware and new software as well as cost analyses. I understand all that. Some cynics have opined that they kept the Internet slow because they wanted passengers out in the casinos and bars, spending money. While that makes (business) sense on the face of it, it doesn’t make sense if you look at the bigger picture: traditional cruisers are aging and will eventually be gone. New generations of digital natives expect and demand connectivity wherever they go. If cruise line companies want to attract that younger customer, they need to provide a connected cruising experience. 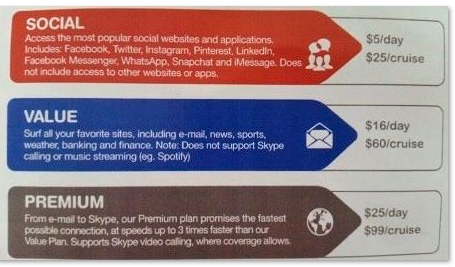 The second problem with on board Internet until recently was the pricing structure. In addition to its snail-like speed, you paid by the minute. That combination meant getting any real work done online could cost hundreds of dollars. On several occasions, I bought Carnival’s top package of 480 minutes for $159 and because of the poor performance, ended up having to buy additional minutes to get me through a 7-day cruise. In comparison to my land-based FiOS connection that costs $179 per month for unlimited data that comes down and goes up at 80+ Mbps, that’s excruciatingly expensive, although to me, it was a better value than the $500 that many people pay for the 15-drinks-per-day Cheers package. And that brings us to another aspect of on board Internet that I initially found surprising. In the cruise-related venues such as Facebook’s Carnival Cruisers Past, Present and Future group and the Cruise Critic discussion forums, mention cruise line Internet packages and a heated argument is certain to follow. Even such a seemingly innocent post as “How much does it cost to use the wi-fi on X ship?” will soon fill with replies telling the original poster that he/she shouldn’t be using the Internet while on vacation, and responses to those replies from those of us who prefer to do what we want on our vacations rather than have it dictated by strangers. 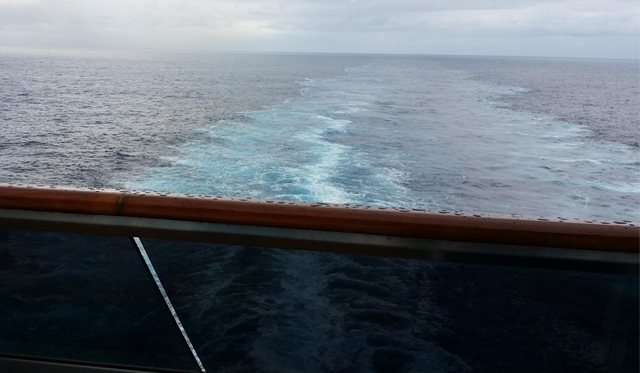 For some of us, connectivity isn’t just for sharing vacation photos in real time on Facebook (not that there’s anything wrong with that); it’s essential to our being able to cruise in the first place. I’m self-employed, a sole proprietor. I cannot be disconnected for a week if I care about keeping my clients and maintaining my business and the income that makes it possible to cruise frequently in the first place. Most of the work emergencies take only a couple of minutes to a couple of hours to address, but they have to be addressed immediately and I am the only one who can do it. Therefore, availability of reliable Internet is critical for me. Aside from that, I also want/need to keep in touch with whomever is house- and dog-sitting for us to ensure that everything is okay back home. The “thou must unplug” advocates are always telling the rest of us that cruises are for relaxing. 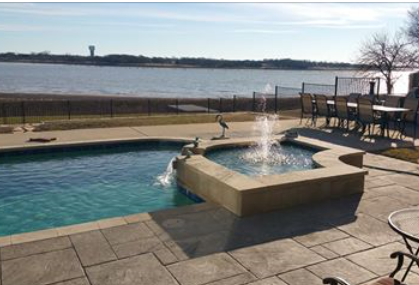 If I were cut off from what’s going on at home, I would not be able to relax and enjoy the cruise. Therefore for me, staying connected allows me to have more fun, not less. Others’ have different priorities, needs and situations and that’s fine. Finally, from a purely “fun” point of view, I enjoy being able to share my photos and videos tales of what I’m doing with my friends and family back home as it’s happening, and they enjoy living it vicariously as it happens. This isn’t necessary, but it makes me (and them) happy, so better Internet connectivity enhances the experience on both sides. That’s why I’ve been a vocal advocate for better on board Internet technologies ever since I got involved in cruising. As a semi-well known “expert” in the tech industry, I’ve shared my opinions and suggestions with cruise line representatives in decision-making capacities as often as possible. 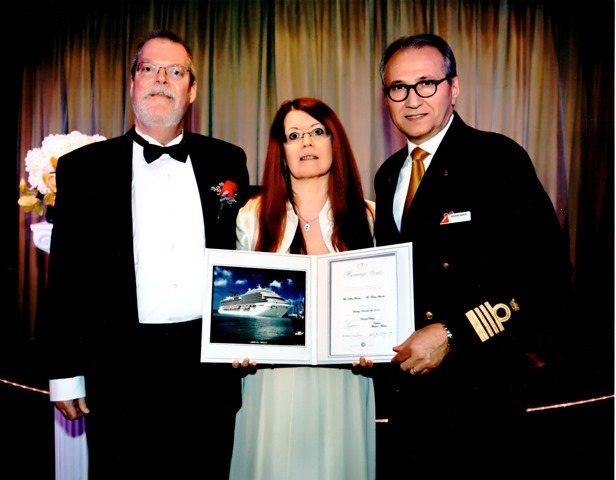 I was thrilled when first Royal Caribbean and then Carnival rolled out new technologies to enhance connectivity on board their ships. There is no down side to this, after all. Those who don’t want to connect don’t have to. It’s paid for by those who do want it. To say that a cruise line shouldn’t do this because you personally don’t care about it would be like saying the cruise ship shouldn’t have a steak house because you don’t care about having a high-end dining experience. I don’t gamble, but it would never occur to me to be bothered by the fact that there’s a casino on board. The gamblers bring in extra revenue for the cruise line that helps keep my fares lower. The Internet packages do the same. Yet in one Facebook thread, multiple people actually commented that they hoped Carnival wouldn’t ever offer high speed unlimited Internet. That type of thinking is incomprehensible to me. I’m not much of a drinker, but why would I care that Carnival offers drink packages for those who do enjoy imbibing? Why do people try to convince others that they should do and enjoy exactly the same things? The whole point of the large ship experience is that there are so many different things to appeal to different interests. When they put in the “Seuss at Sea” program, I had and have zero interest but I’m happy for those parents and kids for whom it will make for a more fun cruise. It seems to me we should all just enjoy the activities and features that we like to engage in and let everyone else do the same. I wrote about how the old technology works in a post on this blog a few months back called High Tech on the High Seas. The great thing about tech is that it’s always advancing. New ways of doing things are constantly being discovered, and transmission of network signals is an area in which intensive research is always going on. The new tech that Carnival has rolled out on a few of its ship (as of this writing, the Freedom, Breeze, Sunshine and possibly Liberty – still checking on that last one) is based on hybrid networking that combines satellite and long-range wi-fi to provide greater bandwidth and data transfer speeds that are ten times faster than the old tech. They’ve trademarked the name WiFi@Sea to label their implementation of this new network that relies on both advanced satellites and land-based antennas that are installed along the cruise routes. The ship’s local area network switches transparently between the satellites and wi-fi access points as the ship sails. It works surprisingly well. I was able to try it out on the Carnival Breeze for an 8 day cruise to Grand Turk, San Juan, St. Maarten and St. Thomas the week of December 6-14. A caveat to keep in mind is that because this hybrid system depends on combining shore-based wireless access points with the satellites, there is potential for the quality of service to be better on some itineraries than others. This might or might not happen, but because of the nature of the network, it’s something of which you should be aware. The pricing for the new tech is considerably better. Some will still think it’s too expensive because they’ll compare it to $40 per month cable Internet packages, but that’s really comparing apples and oranges. Getting connectivity at sea will always be more difficult and thus more expensive than on land. The biggest difference in the new pricing is that it’s unlimited; that is, you don’t have to count the time spent online or resort to “tricks” such as typing up your long Facebook post offline, then connecting and pasting it in and posting it, then logging off again to read new downloaded posts offline to save those precious, costly minutes. Another big plus is that it’s not a “one size fits all” price. Carnival is offering three different tiers of service, and each is available on either a per-day or per-cruise basis. This is very cost effective for those folks who only want a way to keep in touch with friends via Facebook. The “social” package is a great value at $5 per day or $25 for the whole cruise. It provides restricted access to a few select Internet sites, including Facebook, LinkedIn, Twitter, Instagram, Pinterest and several popular Messenger apps. You can’t surf the web or check your email with this plan, but many cruisers don’t need any more than this plan offers. The “value” plan, at $16 per day or $60 per cruise, gives you access to the rest of the web and email protocols. It’s good for those who might need to stay in touch with the office and do some minor work that involves answering company email or logging onto work sites, and for those who like to be able to check the web for info about the ports they’re sailing to or read their favorite news sites every morning. You can’t use high bandwidth applications and sites such as Skype and other video conferencing, or streaming music or movies/TV. The “premium” plan is, of course, the one that I used. It provides more bandwidth and faster speeds, so you can do virtually anything you can do with a home Internet connection (albeit somewhat more slowly). That includes video calls to your dog-sitter so the puppies who are missing you can see and hear you, as well as streaming media if the ship’s entertainment isn’t enough for you. This plan can be purchased by the day for $25 and was $99 for the duration of the cruise. Note that at this point, the per-cruise prices are apparently the same whether you’re on a 6 day, 7 day or 8 day cruise. I don’t know whether those prices will be discounted for shorter cruises or increased for longer ones (although I should find out in early February, when I’ll be embarking on a 12 day repositioning cruise on the Freedom, which was the first ship to get the new packages). The logon process is the same as before. Go to your wi-fi settings on your device, connect to the Carnival wireless network, then open a web browser and you’ll be redirected to the sign-up page. You’ll be asked to choose a plan and enter your folio number (it’s on your Sail & Sign card) and your date of birth, which serves as your password. You should get a message that you’re successfully connected and then, depending on which plan you’ve purchased, you can go to web sites or use mobile apps as you normally do. To log off, just type http://logout.com or 1.1.1.1 in the browser address bar. I used the connection to work a couple of days on board as I had hard article deadlines. My setup onboard with my Surface Pro wasn’t quite as comfortable and efficient as my office at home (see photos below) but it got the job done – in one of the most relaxing work environments imaginable. 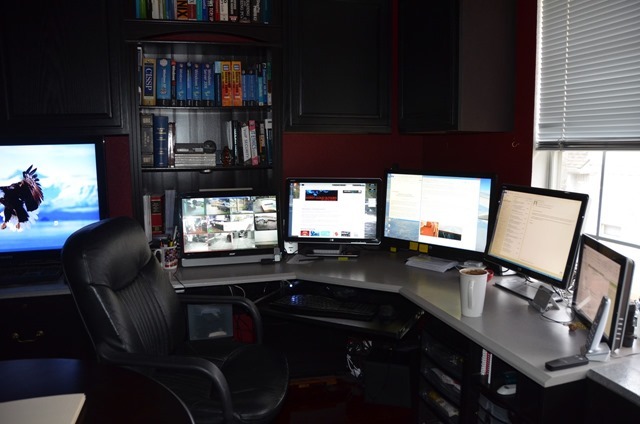 This is my workspace in my home office – a little too complex to replicate on board a ship. Here’s my view at home. Not too shabby, but not the middle of the ocean, either. This work setup on the ship might not be quite as efficient (you can see the edge of my Surface Pro at the right of the first photo), but the view really can’t be beat (second photo). It wasn’t all work and no play. I also used the Internet connection to keep in touch with my son, who was taking care of the house and dogs. And I used it to document the cruise for several hundred Facebook friends who were living vicariously through my posts. 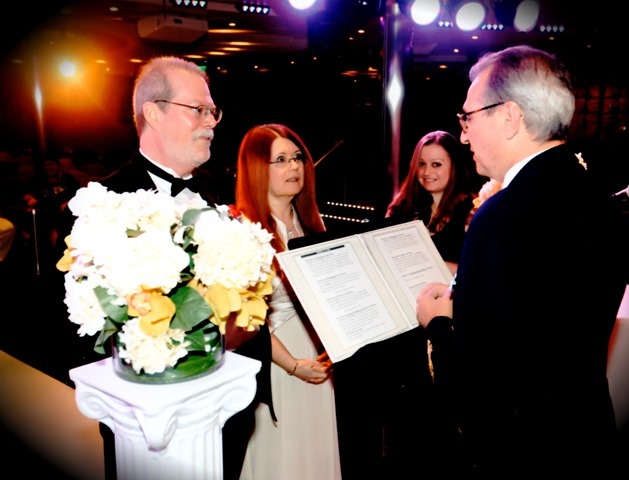 It was my husband’s and my 20th anniversary cruise and we renewed our marriage vows on board in a ceremony officiated by Captain Massimo Marino. 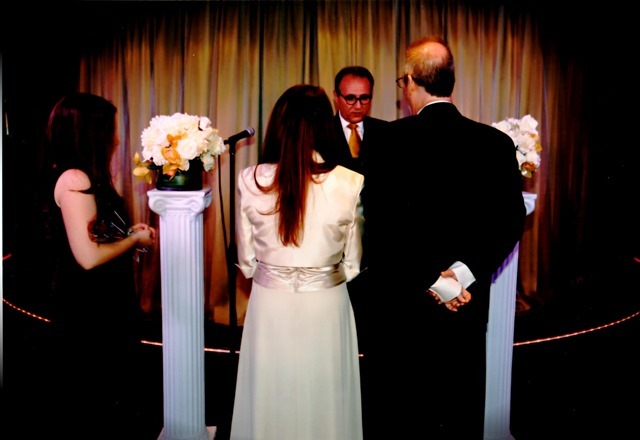 All of our friends and relatives weren’t able to physically be there with us for the “wedding,” but they were there in spirit and were able to see our photos of the ceremony the next day, thanks to the Internet. That one-device-at-a-time limit is perfectly understandable, but it’s annoying even when you’re not sharing the connection with someone else. I needed to log on with my Surface laptop/table when I was doing real work, or posting photos to Facebook that I’d uploaded from my Nikon DSLR. When I was going out and about on the ship, though, I wanted to be logged on with my phone, so I could take a quick picture with its camera and post it on Facebook, so I had to keep logging off one device and on to the other. Not a big deal, but something you don’t have to do on your wi-fi network at home so it’s a noticeable inconvenience. More than once, I found myself out in the public areas of the ship wanting to check my Facebook messages and unable to do so because I had forgotten to log off the computer back in the cabin so I got the dread “You already have a current connection” message. It would be nice if they could add a remote disconnect feature by which you could log off other connected devices, but that’s probably asking too much at this early stage of the game. The connection was far, far more reliable than the old tech, but it’s not perfect. There were a couple of times when service slowed down to a crawl or when I couldn’t log on for several minutes. However, this incidents were few and far between and didn’t last long. All in all, I was very happy with the new service. I don’t judge it by the same standards as FiOS or Google gigabit Internet or other super high speed connections that are available to land lubbers. That wouldn’t be fair. But I do now feel confident that I can take a cruise and plan to work for a few hours a day when we’re at sea, including web research, and not have to spend my time in port looking for a wi-fi connection and working instead of exploring or enjoying excursions. For me, that makes a big difference. I should also mention that, along with the new Internet packages, Carnival had available on this cruise an app for communicating through the local network only. That is, you could message others on board who had also downloaded the app. It was free while in testing, and when we tried it out, it seemed to work okay. However, because we both had Internet connections, we used Facebook Messenger most of the time to stay in touch with one another so I can’t really offer a detailed review. There were just too many things going on during this particular cruise for me to do as much techie stuff as I would have otherwise, but there will be much more free time when I sail in February so look for more then.